SAINT PETER, Minn. – The Gustavus women’s hockey team will travel to Eau-Claire on Saturday to take on the UW-Eau Claire Blugolds, who were responsible for ending their 2017-18 campaign. The NCAA tournament game last season was an instant classic as it went down as the longest game in DIII women’s hockey history as it lasted four hours and went into three overtimes before the Blugolds took home the 3-2 victory. 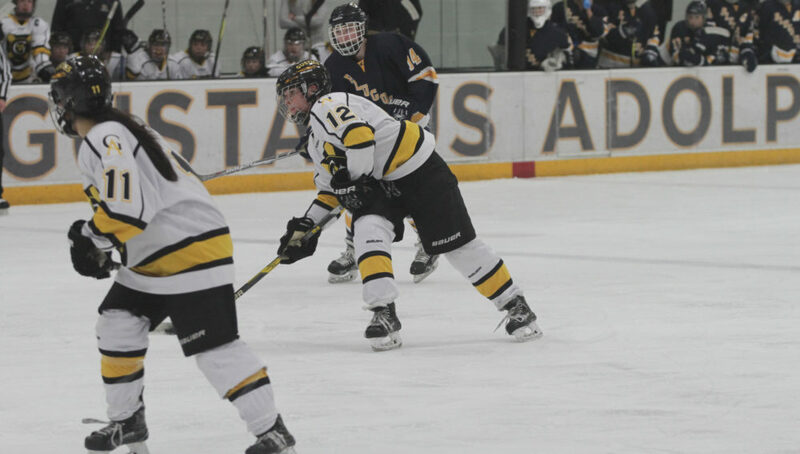 Scouting the Gusties: Gustavus brings in a lot of new faces this season and a few showed up in the box score in their first game of the season when they defeated UW-Superior 2-1. In her first collegiate action, Jamie Byrne (Fy., Delano, Minn.) found the back of the net late in the first period to give the Gusties a 1-0 lead off an assist from Madison Bergren (Sr., Mahtomedi, Minn.). The Yellowjackets scored the lone goal of the second period to even the score at one going into the third. With under eight minutes remaining in the third period, Gustie senior captain Allie Stanger (Sr., Paynesville, Minn.) scored what turned out to be the game-winner off assists from Hannah Kobienia (Fy., Willmar, Minn.) and Kristina Press (Fy., Cottage Grove, Minn.). Two-time All-American goalie Amanda DiNella (Sr., Oakbrook Terrace, Ill.) got the start in net and made 21 saves while allowing just one goal for the win. Scouting the Blugolds: After falling to Hamline 5-4 to begin the season, UW-Eau Claire most recently defeated Marian by a tally of 8-0. Holly Turnbull leads the Blugold attack as she has notched eight points in two games thanks to three goals and five assists. Hanna Zavoral is the other Eau-Claire player with multiple goals as she has found the back of the net twice, while Elizabeth Bauer has tallied five points on a goal and four assists. Erin Connolly, who had 58 saves in the NCAA tournament game last season, has started in net in both games for the Blugolds, making 48 saves, while allowing five goals. The Blugolds will host Bethel tonight for a 7 p.m. contest.